Parenting is tough. I've always tried to stay with the idea that when my kids are ready to do something, they will. Finding the balance between support and encouragement with pushing and insistence is difficult. How hard do we push? How far do we stand back? This week, I was shown that we're doing okay. It started with pull-ups. YES, both my boys still wear pull-ups to bed at night. They successfully learned how to use the toilet during the day right arond 2 1/2. (again - very little pushing - C mastered it in little over 2 weeks, N got it down in just a weekend.) I don't really tell people that they are both in pull-ups at night - mainly because it's none of their business, but also because it's one of those statements that make people think "what's wrong with him / them?" and I'd rather just avoid that. For a long time, they were both wet every single morning, and my sleep was more precious than dealing with wet pajamas and wet sheets. So, we waited. We would sometimes talk about it, but never put any pressure on him. He stayed dry one night. And then another. We started asking in the morning "Hey, are you dry?" If he was, he got a high-five; if he wasn't we said tonight was another chance. He stayed dry 3 nights running. I started talking about wearing undies to bed. He kept choosing pull-ups. After 6 straight dry nights, he said "I think I'll try underwear tonight" I said "Ok!" He stayed dry and thought that was pretty cool. The next night, he wet the bed. He was in tears that night, but B changed his clothes & sheets and tucked him back in with love. He could have chosen to go back to pull-ups, because we didn't say anything . . . but he chose underwear again. We're on the 4th pull-up free night and I think they're history for C.
The first morning he woke in undies, he turned to his dad and said "Today is the day I think we should take off my training wheels!" B says "Okay!" 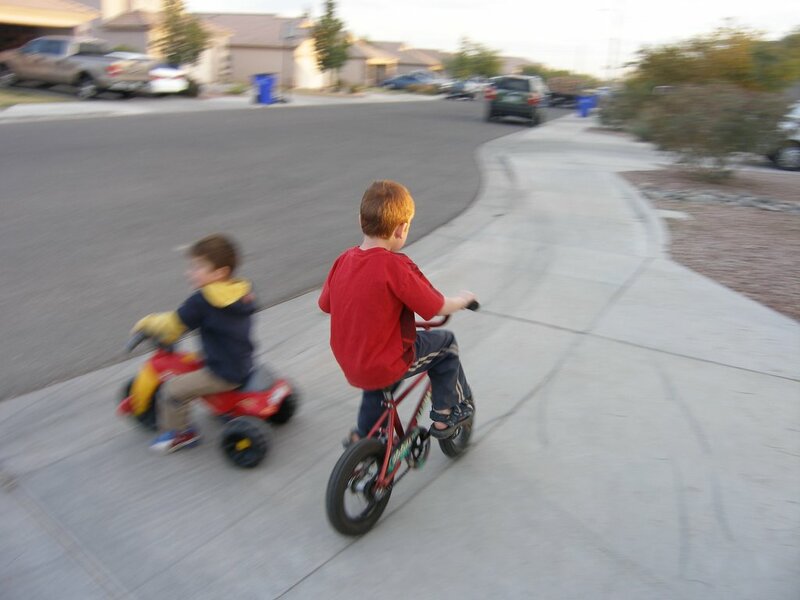 He went out that afternoon and took off the training wheels, expecting to spend the afternoon holding on to the back of the seat and anticipating a sore back (but a worthwhile sore back!). As B is in the garage putting away the wrench, C hopped on his bike and took off. He knew he was ready - and he was! There were some wobbly rides & stops, but for the most part - he's mastered it. He has always been a child who has the need to study something before trying it. He observes, reflects, studies and then acts. B sometimes worries that he is too tentative, but when he is ready to do something, he usually nails it right away. I'm proud of him, and also proud of us - for letting him be who he is. I think like that too! It is so cool to see our patience pay off in the end.